It’s Christmas Eve – and Maisy is getting ready to celebrate! She’s invited all her friends round to her house. Cyril and Tallulah decorate the tree. Charlie is busy with the food, of course! But where is Eddie? He’s vanished! There’s only one thing to do – go out into the snow to look for him! A fun-filled Christmas story of friendship and festivity, full of snow-splashed scenes and merry surprises. Can you colour this fun picture of Maisy riding her bike? Colour in Maisy playing with her books. It’s more fun with Maisy! Decorate and colour a beautiful Christmas tree. Join the dots to help Maisy blow out her birthday candles. 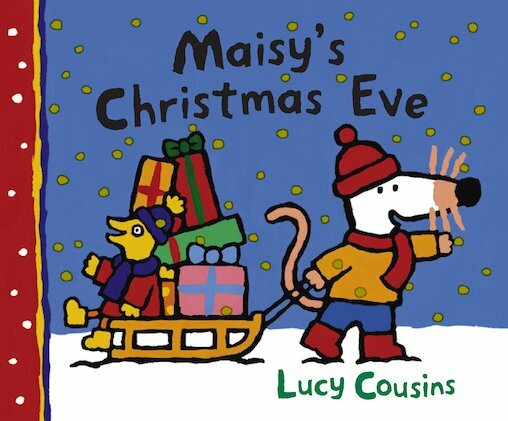 Get festive with Maisy and friends. Have a merry Christmas with Maisy and friends. Make finger puppets of Maisy and her friends.